In a recent talk about maintaining motivation and marketing for his game Spy Party, Chris Hecker mentions that “every damned update Prison Architect does” gets a post on RPS because someone who works there just happens to like the game. Alpha 27 of the prison management sim is out as of late last week and adds a new supply and demand system for food, along with the ability to tap phones and more. The traditional update video is embedded below. All strategy games strive to reach a certain balance; the point at which the player feels responsible for their successes and failures, but where the simulation is so complex and alive that a perfect, static system can never be built. That’s apparently what motivates Prison Architect‘s 25th alpha, “one of the biggest updates” Introversion say they’ve ever done. The main new addition is prisoner reputations, a system of personality types that will make creating a perfectly functioning, forever peaceful prison practically impossible. As ever, there’s a video talkthrough and some more detail of the changes below. Prison Architect developers Introversion Software joke in their latest update that the dev team is now “more like half a million.” As well as an amusing way to introduce the changes to their mod system, which is now much more robust and capable of adding almost anything to the game, it’s also sort of true. Their massive, ever-growing userbase will now add anything they can imagine, for better or worse, and folks will balance out what they want themselves. Others will improve the systems already there or build collections of mods that interact particularly well. Sit back, Introversion, you’re basically surplus to requirements now. Logic can be dangerous. Minecraft players have built everything from room-sized games of Pong to autocannons with its redstone logic circuits, and that’s a relatively peaceful game. If you combined logic circuits with, say, the prison-industrial complex, I dread to imagine what dehumanising mechanisms might be built around inmates. So let’s see what happens now Prison Architect has done just that. It’s fine, though. 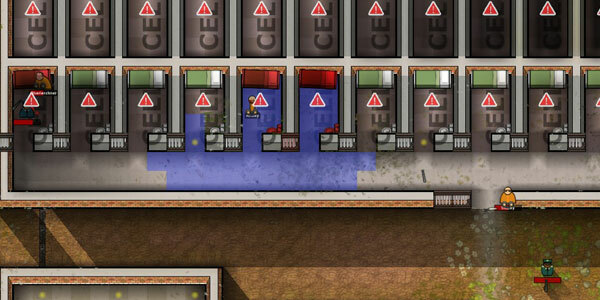 Prison Architect isn’t quite so freeform, and Introversion imagine the new automation and logic tools will be used for things like remote door control systems and sharing clock signals. Which does almost sound like a challenge. It’s possible that some of you have overdosed on Prison Architect update videos by now, but if you’re like me and still in the throes of a monthly addiction to the incarceration management sim’s new features, then this month’s hit is a good one. As explained on the official forum, the major new addition: your prison’s inhabitants can now smuggle in drugs, get hooked on them, and go into withdrawal or overdose. Inject the trailer below directly into your eyeballs to beat the blood-brain barrier. The regular developer video showing the new features is below. 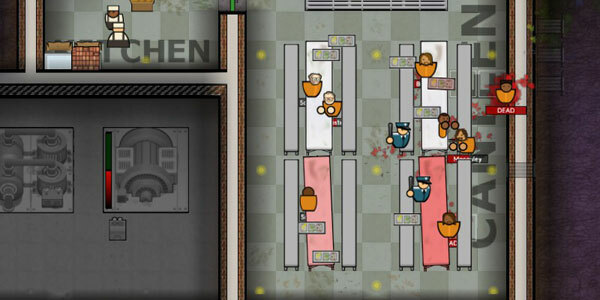 After recent updates added bulletproof vests and shotguns, it was probably inevitable that Prison Architect would continue it’s escalation towards more and more exciting additions with each alpha. The trend continues in alpha 19 with a broad revision to the game’s finance systems, which introduces new rules for borrowing, the need to pay corporation tax, and the ability to sell shares in your prison to investors. Video update below while I try to explain why I’m not being sarcastic. Prison Architect is forever trapped between two political poles: the side that says that prisoners should be locked up, punished, and left to rot; and the side that thinks they should be reformed, educated, and made better able to return to society and not re-offend. Introversion want both methods to have value within their management game, and alpha 18 takes the first steps towards enabling the liberal half by adding therapists. Also tazers. New update video below. It’s been a little while since I’ve seriously played Introversion’s incarceration sim Prison Architect, but I’ve come to enjoy reading and watching their monthly updates just as much as playing it myself. Alpha 17 is now live and the video below details the various additions. The big one: you can now build an armoury in your prison and deck it out like one of those rooms that used to come before a boss fight in first-person shooters. The kind of room full of shotguns, ammo and bulletproof vests. The kind of room prisoners might want to break into in case of a riot. The armoury introduces a new set of tools with which to deal with riots: mainly, guns. If your prisoners are misbehaving, fighting one another or the guards, you can send a group in with weapons to intimidate them into surrendering. You can tell your people not to fire or to fire on sight, but guards will make on-the-spot decisions themselves if they feel their life is in danger and depending on the types of prisoners they’re facing. This ends badly for lots of people – guards and prisoners – in the video above. Of course, a few of your most violent prisoners, if they happen to be close by, will try to get inside the armoury themselves in the event of a riot. You’ll need to make sure it’s behind a lot of big doors to stop that from happening. Other additions for alpha 17 include a forestry, in which trees will grow for you chop down and turn into money, and a new context-sensitive object menu designed to cope with the broadening scope (which is totally dope?) of the game. A full list of changes is over on the update’s forum thread. Now that there’s more ways to deal with madness – and more importantly, many more ways for things to go wrong – perhaps we should send Brendan back in to try and build another nice prison. Prison Architect is an ever expanding incarceration management game, currently in alpha and on a monthly update schedule. If it’s not growing fast enough for you, the most recent update adds something that will help: proper modding support.